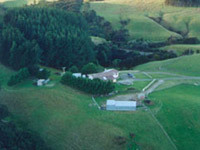 The farm, known as 'Wild Side Farms', is set in the TARARUA district, just east of the Manawatu, north of the North Wairarapa, and south of Hawkes Bay. The farm was chosen for its unspoiled condition and environmental features: native bush, waterway, contour and predominantly north facing location. The unique environmental features of the property met the ideals that Jane needed to develop a unique centre of student learning and at the same time afford the freedom required for the equine individuals undergoing observation, research, readjustment, training and varying types of rehabilitation. 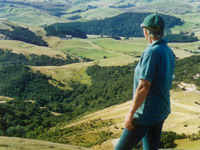 It was at that time in 1999, that the New Zealand Centre of Equine Psychology and Behaviour was born. Under the previous ownership,out of the 350 acres of land the 200 or so grazeable acres had received little or no fertiliser for around 20 years. Seaweed applications, mineral balances, and all-natural soil enhancing fertilisers blended in accordance with soil and herbage test results have since been applied annually. Due to this 'organic' approach, during the past eight years the soil structure has gradually improved. Since the year 2000 the soil's pH levels have risen from 4.8 to 6 - 6.2. The overall condition of the pasture is improved providing a greater density of groundcover and a much deeper root system. Increased worm activity creates a faster breakdown in the manure deposits, increasing the overall fertility of the paddocks. 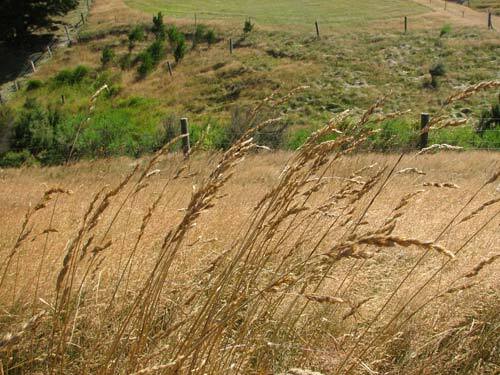 The 'old fashioned' Cocksfoot, Timothy, Crested Dogstail, Prairie Grass, Foxtail and so on provide adequate nutrition for horses, cattle and sheep and exclude the negative affects that the more popular predominant Rye grass pastures have on all of these animal species. 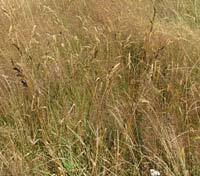 The coarse nature of these grasses is ideal for the horse's digestion. 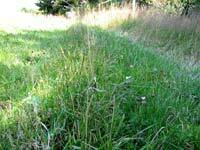 In addition to the grasses, the natural fertiliser programme has encouraged an undergrowth of wild herbage. Yarrow and Plantain for example grow plentifully. Many claims have been made about Yarrow but scientific animal studies show that this plant protects the liver from toxic chemical damage and also aids digestion. 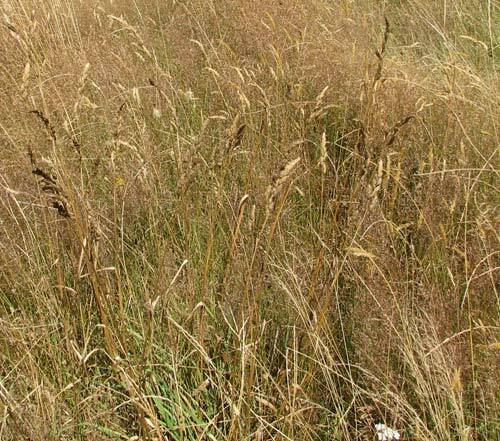 It is also interesting that pastures containing the correct ratio of Plantain enable a significantly higher level of Copper and Selenium uptake than the pure grass mix pastures. The Lotus as well as the White and Red Clovers flourish under the cover of the taller thicker grasses. 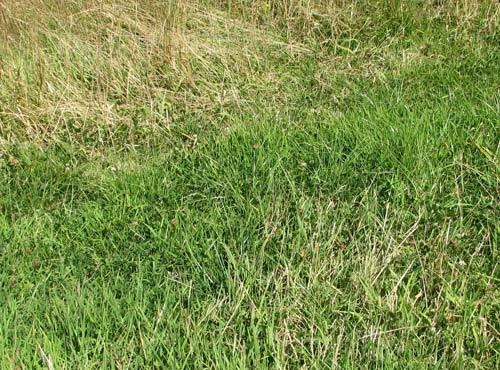 Although Clover as a feed is not ideal for horses, it has its place in pasture management. Clover plants put down deep roots and additionally provide the vital Nitrogen 'fix' essential for soil fertility - naturally. Provided cattle and sheep graze off most of the clover sward, horses are able to make the best use of the coarser grasses with the left over Clover added to the mix that remains. This type of ground cover retains moisture for longer and prevents both sun and wind from dehydrating the surface layers of top-soil. As a result, the pastures are far less affected by dry periods. 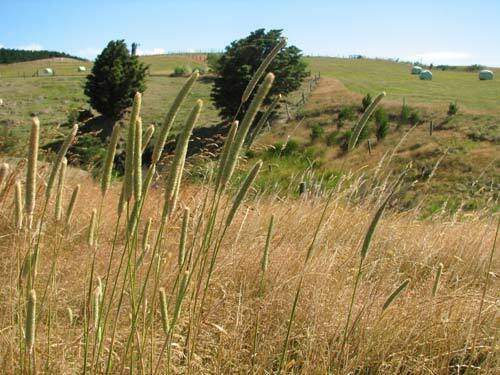 This has been the case, even after mowing and making baleage during the 2007/08 drought. 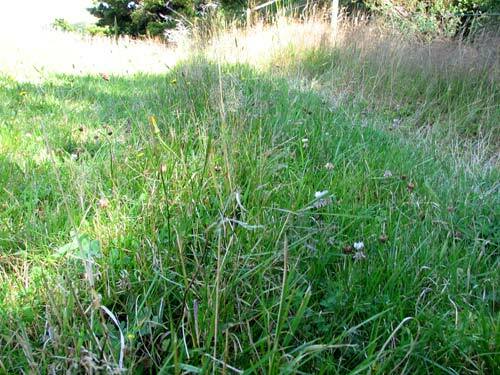 When horses are restricted to limited areas they gradually ruin pasture. Horses do not need the succulent feed that dairy cows do. Neither do they need the types of fodder used for fattening livestock. 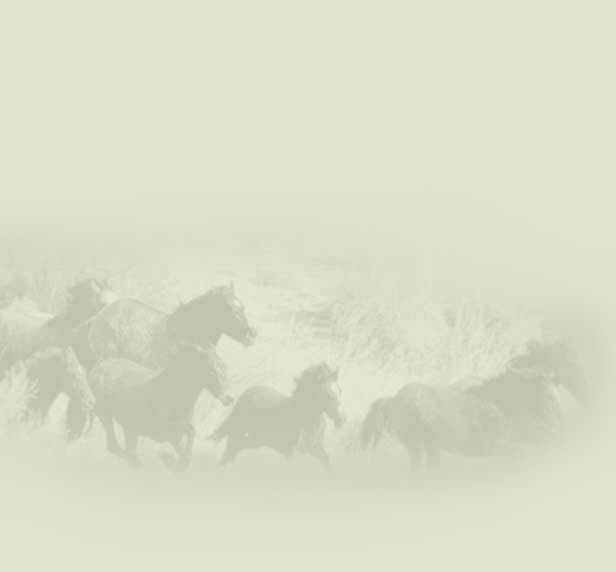 Even so, when managing horse pasture, it is important that every acre of grassland remains grazable and does not slowly become depleted with ever increasing patches of docks, ragwort, and thistles. With this in mind, a rotational grazing plan for horses, cattle and sheep has been maintained at Wild Side Farms throughout. Even the paddocks in the immediate vicinity of the stable area that are used by horses on a day-to-day basis are maintained in this way. This ensures the highest possible standard for the provision of both quality and nutrition. 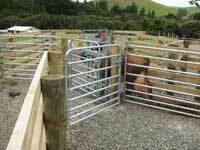 In 2007/08, new cattle and sheep yards were installed as part of the means to handle livestock without having to use neighbouring facilities. Owning livestock enables us to suitably rotationally manage both the hill pastures and holding paddocks on which the horses graze. Originally, the farm was divided into three main blocks with few additional fences. Fencing has been one of the main areas of work since the purchase of the farm. 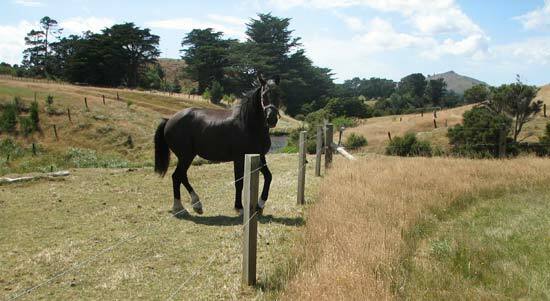 For the purpose of subdividing, Jane and her husband have developed their own style of electric fence that suits horses, cattle and sheep. 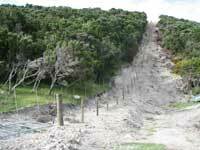 Their design is less expensive than conventional New Zealand fencing and Jane is able to ram the posts and string the wires herself. However, this is only suitable for internal fencing. Fences that adjoin neighbouring farms are a different matter. 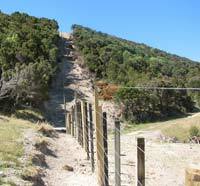 During the early part of 2008, fences that form a boundary to neighbouring farms have had to be replaced. These are big projects that take their toll on time, energy and expense. With the increase of young stock, a foolproof system to quietly move groups of unhandled horses from the hills to the yards has became a priority. In 2007, Jane designed and implemented a 'flow' system of fencing through the main part of the farm that enabled this to take place. Once large areas are divided, shelter and shade for stock becomes reduced or totally unavailable, so within the overall fencing scheme, shelterbelt protection fences have been erected. So too have numerous cross-country fences which form part of the boundaries for each new subdivision. Much of the timber for these has been sourced on the farm and cross-country jumps have been constructed to harmonise with the features of the landscape, whilst still providing suitable training obstacles for the horses. 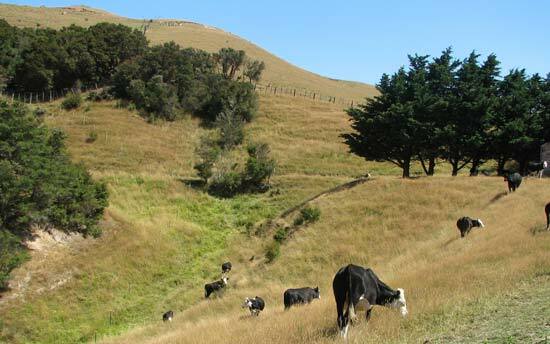 The native bush on the farm hosts a large number of mature Totara and Matai trees as well many other native species. Bird life is abundant with regular sightings of Tui, Bell bird, Paradise Ducks, Grebes, Heron, New Zealand Wood Pigeon, Pipit, Morepork, Kingfisher, Californian Quail and many others. During the Spring season, the creeks and marsh areas are alive with the sounds of bullfrogs. Stock yards were completed in 2007.